At the 2016 Baltimore Crankie Fest. That's me cranking mini crankies in the attic. McKenzie is filming on stage with live video projection. 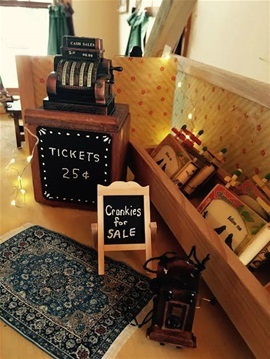 "The Dollhouse" was dreamed up for the 2016 Baltimore Crankie Festival by McKenzie Elizabeth Ditter. 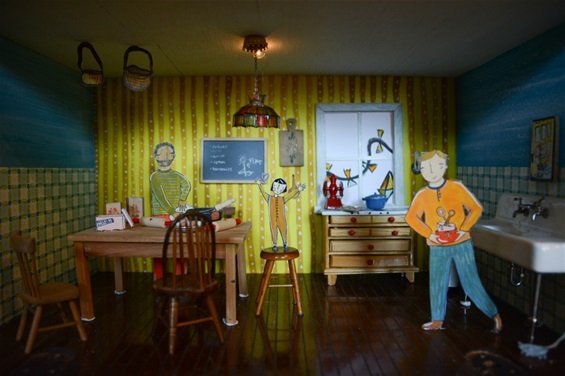 Matt Muirhead built a dozen individual rooms out of reclaimed wood that surround McKenzie's childhood dollhouse, center. McKenzie designed each room to mirror her illustrations and Matt created this video and accompanies it with music on his handbuilt kalimbas. Almost every room with a window has a crankie scroll attached to it from behind the house. As the camera visits each room you will see that the scroll in the window begins to move. 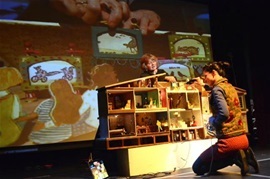 That's Laura Kalman cranking the scrolls behind the dollhouse. You may see the wind blowing or birds flying or stars twinkling in the sky. PURE MAGIC! WATCH THE VIDEO. In this scene, you see the rain falling outside (as Laura cranks the scroll attached to the back of the dollhouse). In the play room you can see a kite flying by in the window (as the scroll is cranked from behind). 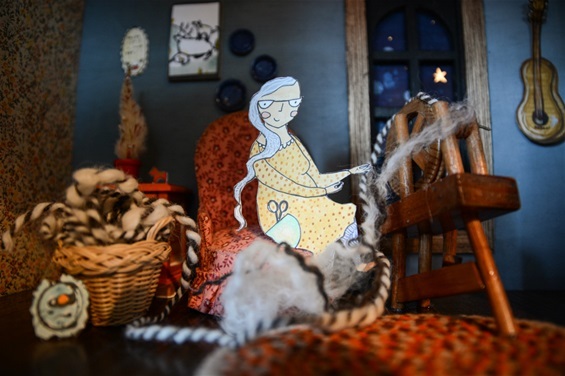 In the spinning room, you see the stars shining in the night sky. 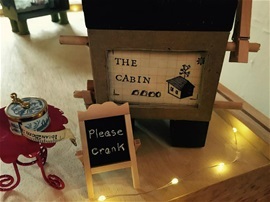 The Crankie Factory Dollhouse - inspired by McKenzie and Matt's. Still a work in progress. I was so inspired by McKenzie and Matt's dollhouse, I had to try it myself. 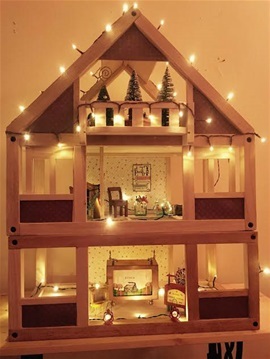 In fact, I ordered a dollhouse on line before I even got back home to Seattle. It is 1/12th scale and still a work in progress, but I wanted to share some photos with you. Hands-on Museum - please crank! The Factory - workshop with a hand-cranked sewing machine, clothes line and spools. You get the idea. If you have any tiny hand-cranked things you do not need, send them my way! Having great fun with this. I think it is a long term project! The Store is stocked with matchbox crankies. Use the hand-cranked phone if you need it. Pay at the hand-cranked cash register! 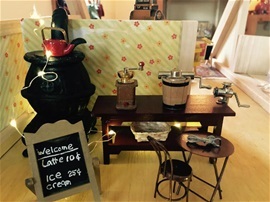 The Hand-Cranked Cafe gives one a chance to take a break and enjoy hand-cranked coffee or home made hand-cranked ice cream. This is one section of the museum, lots of things to crank! The Hands-On Museum houses many miniature crankies and a few other hand-cranked items such as the antique tape measure that belonged to my mother.